It’s always interesting reading books a second time. If it’s been a while since the last time I’ve read it, then I don’t remember all the details, but enough that I manage to completely confuse myself. That’s kind of what happened while read The Mermaid’s Madness, the second Princess book by Jim C. Hines. Now, I also know a great deal of the original fairy tales, not the Disney versions, so I read this story with Hans Christian Andersen in mind, which helped clarify things a bit. 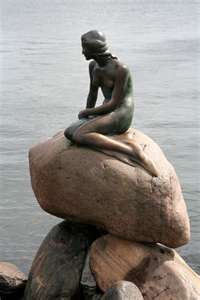 For those who don’t know the Andersen version, the mermaid doesn’t end up with the prince. The prince marries another princess and the mermaid sacrifices herself. Actually, there’s a lot more to it than that, but that’s the basic ending. It doesn’t end that way in Hines’ tale and the book is the after-effects of those decisions. Lirea (the mermaid) kills her prince and ends up going mad because of it. As her madness consumes her, she eventually kills one of her sisters and her father and taking control of her merfolk tribe. She also nearly kills Queen Beatrice and that’s when Danielle, Talia and Snow step in. Lirea isn’t the only mermaid involved; in the beginning and middle of the book, most of the Princesses interactions are with Lirea’s younger sister, Lannadae, and their grandmother, Morveren. And Mermaid’s Madness does for the mermaid culture what Stepsister Scheme did for the fairies. As Danielle, Talia and Snow work to save Beatrice’s soul, they learn more about mermaid culture and traditions. Hines’ way of working that in is one of the reasons that I really enjoy these books. They are part history lesson with the story and in the three books that I have read, I walk away with a little more knowledge of a mythical culture. Hines also highlights the manipulations and politics that exist in the royal class. Talia in particular talks about being attacked and being used as a political pawn and how she feels about it; Snow has also experienced being used at the hands of her mother; Hines also mentions it in the mermaid culture and other human kingdoms, as princes kill each other to get closer to the throne. The most interesting (and slightly sick) manipulations come within the mermaid family as Morveren uses magic on Lirea, controlling her granddaughter’s mind, encouraging her to create one united mermaid tribe to rise against the humans. Morveren uses souls to enhance her magic, human souls. This part of the book draws on Andersen’s concept of souls in the fairy tale; mermaids are made of magic and seafoam and have no souls; when they die, their bodies are returned to the sea. Morveren feels that this makes the mermaids incomplete. But humans have souls and souls have power, so she captures and controls them to do her bidding. She tries to binds the prince’s soul to Lirea and create a new race of mermaids that can live in the sea and on the land. 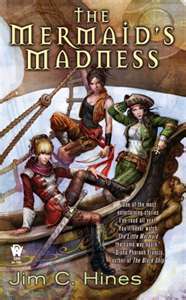 But the magic twists Lirea’s mind and drives her crazy and any attempts to help her only drive her further into her madness. Morveren doesn’t just manipulate Lirea, but Snow White as well. She offers to teach Snow about magic and Snow White is so enthralled that she doesn’t realize all of Morveren’s plans. Talia is also nervous around the mermaids because it is spawning time and the royal mermaids produce a scent that encourages love and lust. It feeds on her attracting to Snow and eventually, Snow finds out about Talia’s true feelings for her, but they aren’t resolved by the end of the book. And Danielle begins to realize how much work goes into being a queen and all the responsibilities that come with it. However, she is unaware of how little time she has to learn everything before Beatrice is gone. Mermaid’s Madness is not my favorite of the Princess Series, although I liked it better the second time around, probably because I understood more of it (I love re-reading books and catching the little details that I missed before). But I enjoyed the exploration of the mermaid culture, mostly because it wasn’t something that I had ever explored before, even though I love all things fantasy. However, it is still a great read and a wonderful tale about the After Happily Ever After, even if we don’t get Happily Forever After.